meghan eats local: Lazy Thursday! Ever since becoming a vegan, I've been dying to check out Lazy Acres Market. It's a grocery store in downtown Santa Barbara that carries "wholesome, natural, and organic foods." Sounds perfect, right? The problem is, well... Lazy Acres isn't the only one who's lazy, and I live within walking distance of the Isla Vista Coop. I had this afternoon "free" (I should have been grading papers, but I figure grocery shopping doesn't really count as procrastination), so I decided to hit up Lazy Acres. First I checked out their website to see if they were having any specials, and much to my delight, today was "Lazy Thursday." Every Thursday at Lazy Acres, students and seniors get a 10% discount. They also have a bunch of items that are marked down a bit on Thursdays. What luck! The name "Lazy Thursday" obviously brought to mind the 2005 Saturday Night Live Digital Short "Lazy Sunday." The only thing I love more than 10% student discounts is the brilliance of Andy Samberg and The Lonely Island, so as I headed downtown I was feeling great. I even listened to "Lazy Sunday" on the drive, just to get in the mood. As I used Google Maps on my phone to figure out where on earth Lazy Acres was, I remembered the lyrics: "Google Maps is the best!" / "True dat!" / "DOUBLE TRUE!" Google Maps is the best, and it got me to Lazy Acres in about 20 minutes. I wanted to eat everything in the whole store. But I knew I had to be choosy. The student discount was, after all, only 10% off. I got the basics like almond milk and whole grain bread, but I couldn't help being tempted by the vast selection of produce. I felt inspired. I grabbed a plantain and a yucca root to combine with the avocado I still have from Plow to Porch. I wanted to make an Ecuador-style dinner. When I was visiting my sister in Ecuador two summers ago, pretty much every meal we ate consisted of some combination of plantain, yucca, and avocado. In Ecuador, we found the avocados outside on the ground, we used the yucca Katie grew in her backyard, and we paid about one cent for each plantain. 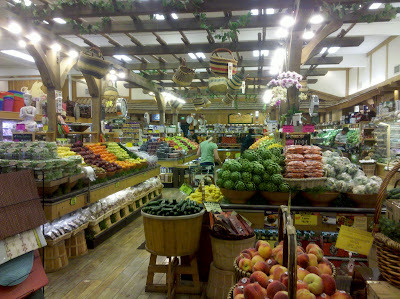 Here I was, paying $3/lb for the same ingredients at a trendy organic market in Santa Barbara. I am nervous about misusing the word "ironic," but I'm pretty sure this situation qualified. But the product I was most interested in trying was the vegan chocolate mousse. It's made of raw young coconut milk, organic virgin coconut oil, organic dates, and organic raw cacao. I still had a Tupperware full of soy frozen yogurt in my freezer, so I bought the chocolate mousse for the purpose of putting on top of the fro yo. It was a heavenly combination. In conclusion, I'm going back next week for more "Lazy Thursday" groceries. Lazy Acres might not be "The Chronic-what!-cles of Narnia," but it's a dreamworld of magic in its own crazy-delicious way.